I am writing this blog from the capital of Burkina Faso, Ouagadougou. Eugénie is on her way to the USA / Tijuana (Mexico) to accompany to Claire (daughter) who is undergoing further treatment in a hospital for her cancer. I am sure that many of you will say “Why do you have to go to Tijuana to treat a cancer?”. Claire does not believe in conventional treatments, nor do Eugénie and I. Since unconventional treatments are fought by the lobbyists of the pharmaceutical industry via doctors, people have to go to Mexico (just over the border) to get these unconventional treatments. It has been a very long time since I have heard the farmers complaining about their harvests. The price of the corn is already 15% higher than the normal price at this time of the year. Regarding the cotton, some farmers are talking about bad seeds, others bad treatment against insects on top of the bad rainy season. It will be a difficult year for the villagers. We have been able to provide 650 beehives to villagers. One of the difficulties encountered is to get and keep swarms in the hives. Only 50 to 60% are populated. There are many reasons for this situation. 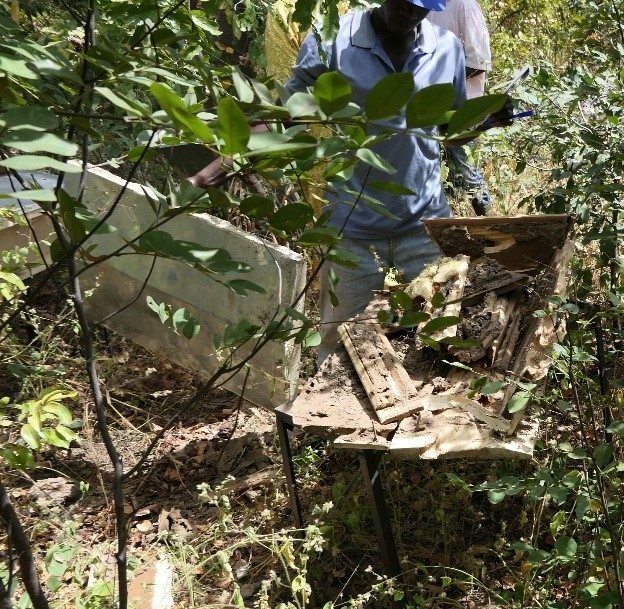 Wrong location or positioning of the hive, competition with other insects (termites/hornets), physical state of the hive…. We have started an audit with a professional beekeeper in the villages where there are hives. We have already visited 6 locations. Following this audit, we will offer additional training to the villagers. For many associations in the villages (women, farmers, parents, medical post), board members are not volunteering to take responsibility because there is possibility to steal some cash. In the village of Fina there were2 women who have been managing the women association since a minimum 20 years… When we asked them if they are not tired, they say they are and that they want out. But they say nobody wants to take the responsibility. Following some difficulties to get some reimbursement of a loan, we called for a meeting of the women in Fina. We were able to ask them to renew the board without including the 2 older women. Those 2 women were happy about it in front of the other women, but then they came to us privately and ask us why we wanted to kick them out……. Next week we should get the composition of the new board. A small bird fell out of his nest on a very cold morning. A farmer passing by sees the little bird shivering on the ground. He decides not to take him home because of the cats, instead he makes a small nest for it in the middle of fresh warm cow dung. The little bird is very happy and starts to sing. A fox passing by hears the little bird sing and eats it. Un petit oiseau est tombé de son nid pendant une matinée très froide. Un fermier qui passe voit le petit oiseau frissonnant sur le sol. Il décide de ne pas le ramener à la maison à cause de ses chats. Au lieu de cela il lui fait un petit nid au milieu d’une bouse de vache fraîche et chaude. Le petit oiseau est très heureux et commence à chanter. Un renard qui passe l’entend chanter et le mange. Celui qui vous sort de la merde n’est pas toujours votre ami.